Shoulder subluxation or shoulder instability occurs when the shoulder partially dislocates. By its nature, the shoulder joint allows a large range of movement which means it is likely to be less stable. There are several reasons why the shoulder joint may be unstable and dislocate which are described below. Medical help from a physiotherapist will help as they can give exercises to help strengthen and stabilize the area. No single structure is responsible for providing stability at the shoulder joint. The bones, ligaments, joint capsule, and muscles are all key components in maintaining a stable shoulder joint yet permitting a large range of movement in several directions. Shoulder instability is often associated with subluxation or a partial dislocation of the shoulder joint, which may be associated with pain and/or dead arm sensation. This is often what prompts the athlete to seek medical attention. In some people, a partial dislocation of the shoulder is not actually painful but can be quite annoying and prevent them from taking part in certain daily activities or sports. Shoulder subluxation can occur in one direction, for example, anterior instability where the arm or humerus bone pops out the front, posterior instability where it partially dislocates out the back or in more than one direction which is known as multi-directional instability. 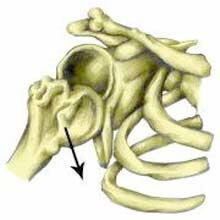 The most common form of instability seems to be anterior and is probably because the joint capsule is at its weakest at the front of the joint. Glenoid Labrum – a ring of cartilage which deepens the glenoid fossa, making the “cup” of the socket deeper and hence improving stability. Joint Capsule – a membrane which encompasses the entire joint, providing stability but also maintaining the joint complex and holding the lubricating (synovial) fluid in the correct place. Ligaments – holding the bones together and providing stability by preventing them from moving when they shouldn’t be. Muscles – Work alongside the ligaments in preventing unwanted movement, but also initiate and create a movement of the joint. The therapist will perform a range of tests to determine what type of shoulder instability the athlete is experiencing, and will take a detailed history to attempt to discover why this is occurring. They will also assess whether you have a condition which has caused you to have lax ligaments throughout your body, known as Hypermobility. A strengthening program to help you develop the muscles around the shoulder which are responsible for stabilizing the joint is usually recommended. A type of electrotherapy, similar to a TENS machine can allow the athlete to identify the muscles which are not working properly. A tiny electric current to make the muscle tingle helps the athlete to train the muscles more efficiently. In some cases of instability (particularly traumatic instability), if conservative treatment with physiotherapy does not work, surgery may be an option. There are various techniques available to the surgeon to improve the joint laxity at the shoulder, however, this will always be followed by intensive rehabilitation to ensure that you do not lose any movement at the joint. Arthroscopies are being used more frequently to diagnose the cause of instability. This is a minimally invasive procedure where you are given an anesthetic, and a small fibre optic camera is introduced to the joint to inspect the structures and assess for any damage which might be repairable by surgery.